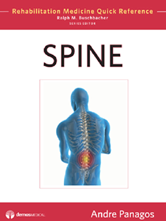 This volume broadly covers the complex topic of spine care. Broken down into 100 conditions, the bulleted text and helpful illustrations provide a clinical roadmap for diagnosing and treating spine disorders commonly and not so commonly encountered in daily practice. Every entry features description, etiology, epidemiology, pathogenesis, risk factors, clinical features, natural history, diagnosis, red flags, treatment, prognosis, helpful hints, and suggested readings on two facing pages for easy access to key information at a glance.